There's nothing nicer than a sun-warmed tomato, freshly picked from your own back garden. Tomato ‘F1 Shirley’ is hard to beat. This early maturing tomato has been very popular for home cultivation since the 1970's and has rapidly established itself as the nation's favourite. Tomato 'F1 Shirley' is one of the best varieties suitable for cold or slightly heated glasshouses. It is indoor cordon type and the fruits are grown on short joints. The robust plants crop early and heavily over a long period of time and regularly produce more than 6kg (13lb) of fruits. Resistant to Tobacco Mosaic Virus, Cladosporium fuluum race A,B,C,D and E and Fusarium oxysporum race 1 & 2. Highly recommended and easy to grow, Tomato 'F1 Shirley' produces excellent quality, medium sized red fruits with a firm skin and a lovely taste and texture. 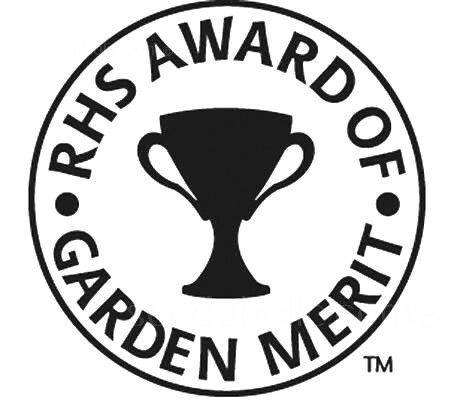 Tomato 'F1 Shirley' has been awarded the RHS Award of Garden Merit (AGM). Plant about 3mm (1/8in) deep, in small pots using seed starting compost. Water lightly and keep consistently moist until germination occurs. Tomato seeds usually germinate within 5 -10 days when kept in the optimum temperature range of 21 to 27°C (70 to 80°F). As soon as they emerge, place them in a location that receives a lot of light and a cooler temperature (60 to 70°F); a south-facing window should work. When the plants develop their first true leaves, and before they become root bound, they should be transplanted into larger into 4 inch pots. Young plants are very tender and susceptible to frost damage, as well as sunburn. I protect my young plants by placing a large plastic milk jug, with the bottom removed, to form a miniature greenhouse. Depending on the components of your compost, you may need to begin fertilising. If you do fertilise, do it very, very sparingly with a weak dilution. Transplant into their final positions when they are about 15cm (6in) high. Two to three weeks prior to this, the plants should be hardened off. Just before transplanting the tomato plants to their final position drive a strong stake into the ground 5cm (2in) from the planting position. The stake should be at least 30cm (1ft) deep in the ground and 1.2m (4ft) above ground level - the further into the ground the better the support. As the plant grows, tie in the main stem to the support stake - check previous ties to ensure that they do not cut into the stem as the plant grows. Dig a hole 45cm (18in) apart in the bed to the same depth as the pot and water if conditions are at all dry. Ease the plant out of the pot, keeping the root ball as undisturbed as far as possible. Place it in the hole and fill around the plant with soil. The soil should be a little higher than it was in the pot. Loosely tie the plant's stem to the support stake using soft garden twine –allow some slack for future growth. A constant supply of moisture is essential, dry periods significantly increase the risk of the fruit splitting. Feed with a liquid tomato fertiliser (high in potash) starting when the first fruits start to form, and every two or three weeks up to the end of August. In September, feed with a general fertiliser (higher in nitrogen) in order to help the plant support it's foliage. Over watering may help to produce larger fruit, but flavour may be reduced. Additionally, splitting and cracking can result from uneven and excessive watering. Tomato plants come in either Determinate (bush) or Indeterminate (vine) form. 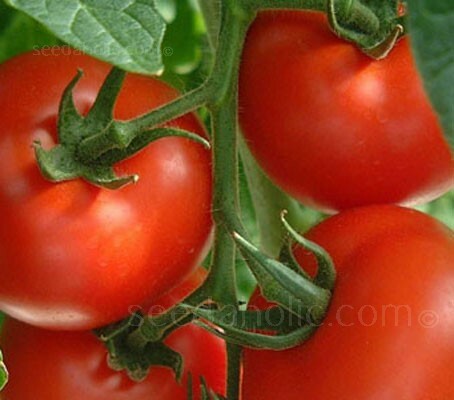 Determinate tomato varieties are often referred to as “Bush” tomatoes, because they are generally shorter and do not continue growing in size throughout the growing season. Determinate varieties are generally smaller and more compact than indeterminate tomatoes. Pruning and removing suckers from determinate tomatoes is not recommended. The plants are seldom more than 60 to 90cm (2 to 3ft) tall. Many of the very short varieties need little or no staking, but despite their compact size, staking can be useful since the concentrated fruit set can contribute considerable weight to the branches. Determinate tomatoes grow to a fixed mature size and typically produce one large crop of fruit. They ripen all their fruit in a short period, usually about two to three weeks. Once this first flush of fruit has ripened, the plant will begin to diminish in vigour and will set little to no new fruit. When the terminal buds set fruit, the plant growth stops. They produce fruit at the end of their branches. In general, many of the earliest varieties are determinate types. Many paste or roma tomatoes are determinate varieties, while others are bred to be determinate. Commercial growers favour this type of tomato because all the fruit can be mechanically harvested at once. The major advantage of planting determinate plants in a home garden is early harvest. Growing determinate variety tomatoes also makes good sense when you want a large amount of tomatoes all at one time, to make tomato sauce. Indeterminate tomato varieties often referred to as “Vine” or “Cordon”, will keep growing and producing new blossoms even after the fruit is set. Indeterminate tomatoes produce fruit clusters along their stems. Indeterminate tomato plants continue to grow and produce tomatoes, limited only by the length of the season until frost kills the vine. These plants produce stems, leaves, and fruit as long as they are alive. Harvest may last for several months. Tomato growers seldom allow tomato plants to actually vine. Indeterminate tomato plants will require substantial staking or caging to support what can become a large 180 to 300cm (6 to 10 ft) heavy plant. They require stakes to keep the plant from sprawling on the ground. Semi-determinate plants, as the name implies, are somewhere between these two other types. The plants are generally larger than determinate (bush types) but smaller than Indeterminate plants usually growing 90 to 150cm (3 to 5ft) These plants usually require some staking. Semi-determinates are best grown to just three or four stems.